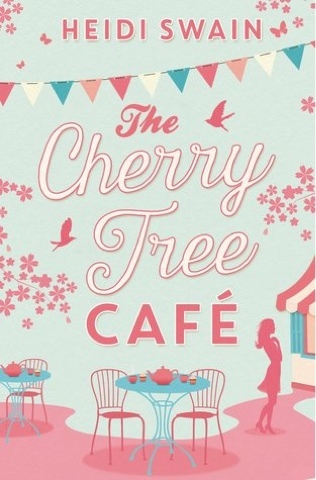 Cupcakes, crafting and love at The Cherry Tree Cafe... Lizzie Dixon's life feels as though it's fallen apart. Instead of the marriage proposal she was hoping for from her boyfriend, she is unceremoniously dumped, and her job is about to go the same way. So, there's only one option: to go back home to the village she grew up in and to try to start again. Her best friend Jemma is delighted Lizzie has come back home. She has just bought a little cafe and needs help in getting it ready for the grand opening. And Lizzie's sewing skills are just what she needs. With a new venture and a new home, things are looking much brighter for Lizzie. But can she get over her broken heart, and will an old flame reignite a love from long ago...? For everyone who loves settling down to watch Great British Bake-Off, the Great British Sewing Bee, or curling up to read Milly Johnson or Jenny Colgan, The Cherry Tree Cafe is a coffee-break treat. This is the debut novel by the author, but I'm sure I won't be the only reader to be waiting eagerly for her next offering. Even the gorgeous cover of this book has you keen to open it up and find out what transpires within its pages. From page one, it hooked me in and had me glued to the pages. The story revolves around Lizzie Dixon. We meet her on her birthday, when she is preparing to go out to dinner with her boyfriend of 18 months, Giles, who she thinks is about to propose to her. Quite the contrary, he breaks up with her to return to his ex. Homeless and eventually jobless, Lizzie decides to return from London to her home town of Wynbridge where her old school friend Jemma and her husband Tom have recently taken over the Cherry Tree Cafe and are in the process of returning it to its former glory. They offer her accommodation in the self-contained flat above the cafe and she gets involved in their project. With more time on her hands, Lizzie rediscovers her love of crafting, and an idea is born. There are lots of other characters to meet along the way. All of them have strong parts and their own interesting stories. These include: Ben, Lizzie's high school crush, who has also recently returned home; Jay, a newspaper reporter; Lizzie's mum and dad; and Deborah and Heather, who own a crafting cafe in London. I really enjoyed reading this novel. I found most of the characters likeable, but it was good to have a few evil ones in there for good measure. I really liked the way that Lizzie's mum changed as the story progressed. I feel sure that there is something for everyone here - humour, drama, baking, sewing and, of course, romance. I would like nothing better than to walk into Cherry Tree Cafe, order a tea and one of the marvellous-sounding cakes and maybe run up a cushion cover. The book would make a perfect holiday read or equally one to curl up with while it's pouring outside yet again. I for one will be looking for more from Heidi Swain. You might be qualified to get a free $300 Ikea Gift Card.